The wheel of cheese on the Raclette machine is heated to the right temperature and scraped onto a plate, to be enjoyed with condiments such as bread, raw vegetables, fruit, meat, potatoes and many more. If the only melted cheese you’ve tried is on pizza or a toastie, then you have a lot to experience in the incredibly satisfying world of molten cheese. But when it comes to melting cheese not all cheeses are equal – some melt better than others, allowing unlocked textures, flavours and taste to ooze out. Being a cheese lover, I sure you will like watching the cheese melt and its flavour. 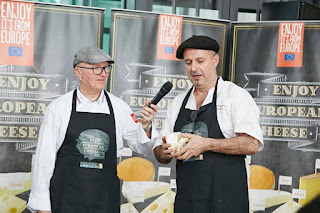 Chef Pierre Gay, a cheese master, cheese connoisseur and expert from France, shared his extensive knowledge on European cheese through a Raclette party jointly organized by the French Interbranch Dairy Organization and European Union, to promote the pre-eminence and finesse of European Cheese. The beautiful assortment of condiments such as sliced capsicum, carrots, mushrooms, meat as well as pickles, grapes and pineapple, to be enjoyed with the various types of European Cheese. “Raclette is a fairly new concept in Malaysia and for a country that loves cheese so much, this is an experience that Malaysians do not want to miss,” explains Chef Pierre Gay. “Raclette is a cheese made of cow milk that has been broiled or melted under direct heat until oozy and a bit crispy and usually scraped over potatoes, crunchy vegetables or cured meats” says Chef Pierre Gay. 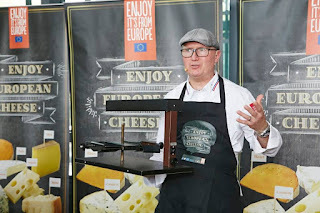 Chef Pierre Gay, the cheese master, cheese connoisseur and expert from France explaining what Raclette means and demonstrating a Raclette machine at the European Cheese event on 22 March at Cocott’ KL. He went on to explain that watching the cheese melt and being scraped over the food is part of the sensory experience of a Raclette. Chef Pierre Gay is the owner Pierre Gay Fromagerie – one of the oldest cheese houses in Annecy, in the Rhone-Alps in eastern France. The fromagerie known in the region for its fine cheeses was started in 1935, and Pierre took over the company in 1989 from his father. Pierre’s dedication and efforts paid off when he was crowned Meilleur Ouvrier de France (MOF) year 2011, a recognition of being the top in his trade. 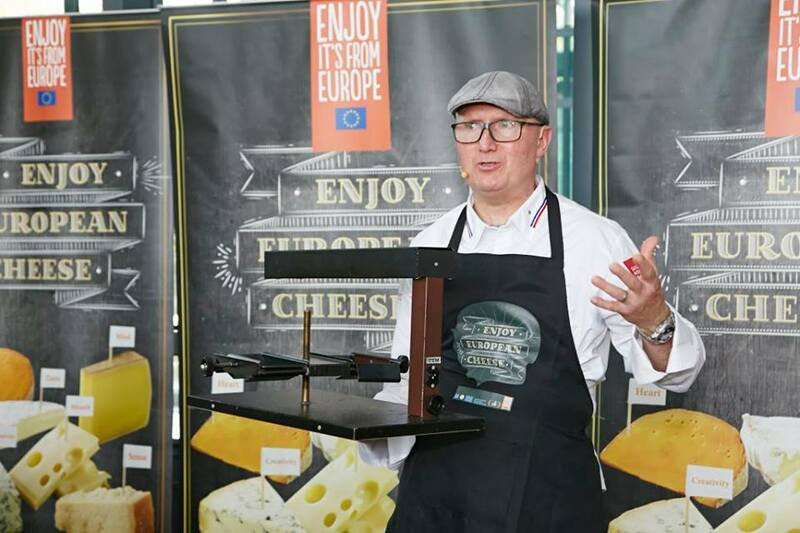 With a mission to educate the public in Malaysia of the different varieties of European cheeses, and how best to enjoy them, Chef Pierre Gay gave an insight into the world of European cheese through a Raclette Party recently at Cocott’ KL. Members of the media and guests also had a chance to melt and enjoy Brie, Reblochon, Fourme D’Ambert, Comte, Saint Nectaire, Gouda and Scamorza over table top Raclette machines, enjoyed with various cooked and raw vegetable such as Sliced Fresh Pepper, Button Mushroom, Tomatoes, Corn Kernels, Sliced Green Onions, Pineapple, Baked Potatoes, Cooked Carrots & Peas, Sliced Conference Pears, Sliced Green Apples and Seedless Grapes along with different meats including lamb, beef bacon, smoked chicken and sausages. The tantalizing spread also featured baguette bread, trimmings such as silverskin onions, gherkins/cornichons and spices such as pepper, salt and chilli flakes. 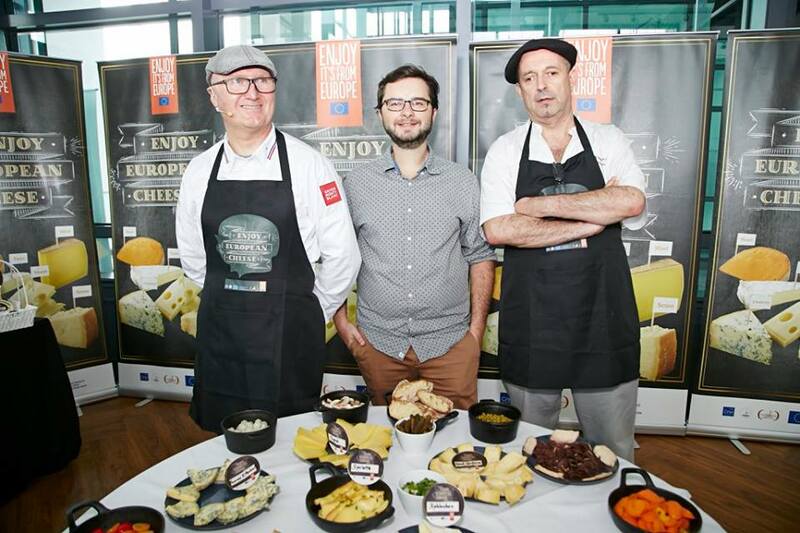 (from left) Chef Pierre Gay, the cheese master from France, Richard Krystkowiak representing SOPEXA and Chef Jean Michel Fraisse posing in front of various types of European cheeses demonstrated at the Raclette fete on 22 March 2018 at Cocott’ KL. The Chef used Raclette cheese which he melted in a large Raclette machine, then scraped over the cured meats and condiments to the delight of the guests. 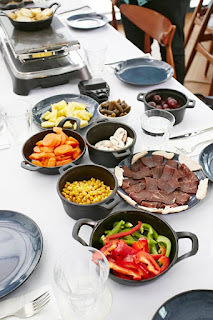 “The Raclette cheese is an excellent melting cheese and the main cheese used in raclettes and fondues. 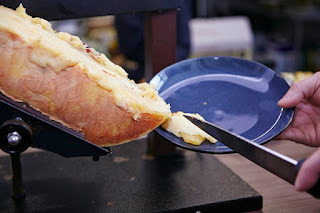 Pungent yet savoury, the Raclette’s pH level gives it the perfect melting point resulting in a molten liquid that is stringy and holds its shape at the same time,” he added. Considered to be one of the most versatile foods in the world, cheese can be eaten as it is, paired with a classy wine or even incorporated into any dishes – from cold to hot, sweet to spicy, from appetisers to desserts – most cheese recipes only need a few additional items added to the star ingredient to make them fantastic. With stringent quality control and regulations in Europe, European cheeses are always of the highest quality, and the best cheese products are readily available to the consumers in Malaysia. 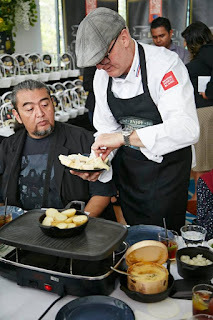 A Raclette which is a new concept in Malaysia is a great way to enjoy European cheeses and can be recreated easily at home to be enjoyed with friends and family, giving the traditional cheese platter a noveler and enjoyable upgrade. Organise your own Raclette Party and get ready to melt into an epicurean journey with the world’s best European cheeses.